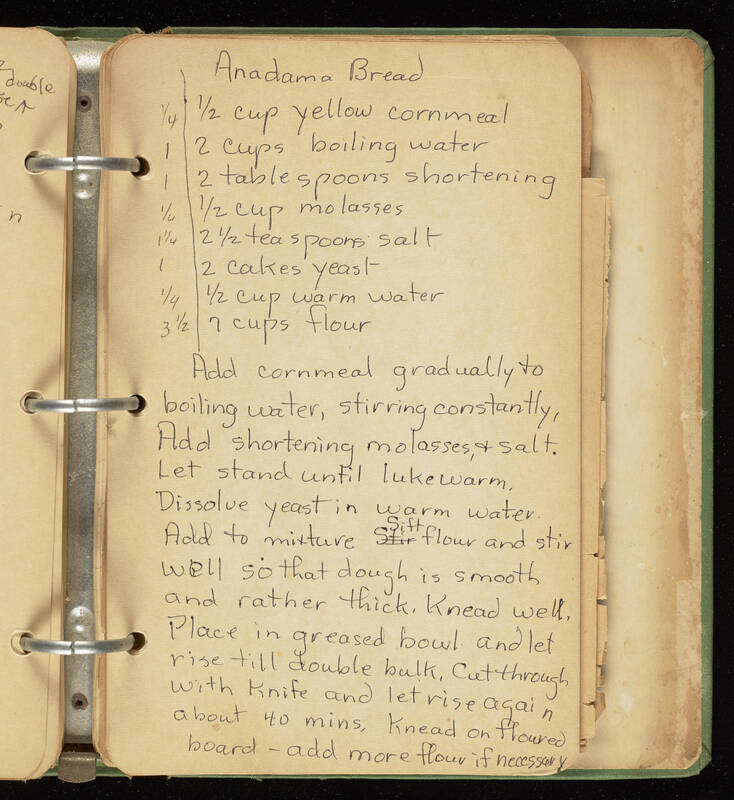 Anadama Bread 1/4 │ 1/2 cup yellow cornmeal 1 │ 2 cups boiling water 1 │ 2 table spoons shortening 1/4 │ 1/2 cup molasses 1, 1/4 │ 2, 1/2 tea spoons salt 1 │ 2 cakes yeast 1/4 │ 1/2 cup warm water 3, 1/2 │ 7 cups flour Add cornmeal gradually to boiling water, stirring constantly. Add shortening, molasses and salt. Let stand until lukewarm. Dissolve yeast in warm water. Add to mixture sift flour and stir well so that dough is smooth and rather thick. Knead well. Place in greased bowl and let rise till double bulk. Cut through with knife and let rise again about 40 mins. Knead on floured board - add more flour if necessary.